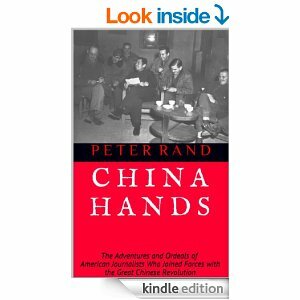 In this book review, George Levrier-Jones tells us about the excellent China Hands by Peter Rand. The book tells the incredible stories of American journalists in China from the 1920s onwards. I’m sure many of you have been watching the news about Ukraine lately. I’m sure many of you were watching the news during the Arab Spring. This got me thinking, as something that has always intrigued me is how journalists covering these events get to where they are in the world. Whether that be the reporter in Ukraine who accompanied troops as they confront each other. Or the reporter in Libya who tried to be close to the fighting in the rebel uprising against Colonel Gaddafi. And when I say where, I don’t only mean physically. In theory anybody with the right press pass could get close to these areas. It is the mentality that also interests me. Is it bravery, stupidity, or the quest for adventure that leads to people to put themselves in often dangerous and unknown situations? Or just a desire to tell others what is happening in the world? A dashing couple. Edgar Snow with his wife in China. Source: Edgar Snow Collections, University of Missouri, Kansas City. Well, whatever the case, such questions were raised in my mind once again while reading the book China Hands by Peter Rand. This book was published a number of years ago, but we heard about it recently as we were researching authors who had written about articles related to Chairman Mao Zedong, the Great Helmsman who led China for over 25 years from 1949. That led us to this book for several reasons, but key among them was the unique story of Edgar Snow. Snow went to China in the late 1920s and decided to settle there. He worked as a journalist and covered all manner of events during what was a very turbulent time in Chinese history. The Chinese Civil War was erupting as the Nationalists led by Chiang Kai-shek battled Communist forces in a long-running war. Violence also seemed to be forever close to the surface of society, even in cities. But this book does not just tell the story of events in China. It also looks at the lives and the thinking of the people involved. And Snow had a very interesting personal life. He married Helen Foster in the early 1930s, somebody who was in many respects more ambitious, able and determined than he was. That would be a constant source of tension for the couple. Snow was later chosen by the communist hierarchy to meet Mao Zedong, the man who was of course to go on to dominate China. When Snow met him though, Mao was in a cave with his hardy soldiers, having been the victim of Chiang Kai-shek’s Nationalist forces. In some ways Snow was in the right place at the right time for this famous meeting, but it also helped that he was not strongly affiliated with communism or socialism. That meant that he had more credibility in the eyes of the many in America to whom his encounter with Mao would be told. A second factor that worked in his favor was that America was not gripped by anti-communist hysteria in the 1930s – that truly started after World War II. But as I’ve just hinted at, a number of the Americans who went to China were closely associated with communism. There was Harold Isaacs, a man who supported the rebelling communists. Equally, there was Rayna Prohme. She went to China in the 1920s, as somebody already affiliated with the communists. Prohme had a certain joie de vivre, and was noticeable wherever she went as she was tall and had striking red hair. While in China, she edited a newspaper, but perhaps more importantly, became closely involved in political machinations. She was involved with shadowy Soviet agent Mikhail Borodin, a man who was under orders to support the Nationalists more than the Communists on occasions. And amid all the chaos in China, Prohme was to make one very important trip to the heart of the communist empire, Moscow. This book recounts that tale in detail – from the luxury to the back-stabbing. And aside from those mentioned above, there are a number of other stories and lives considered in this book. In summary, this book shines a light on several areas. It provides an intriguing view of a China in chaos from the 1920s onwards. It really gives you a feel for the turbulence and fear that people had to live through. It also gives us an insight into the wider communist world. The links between Joseph Stalin’s USSR, the Chinese Communists, and the Chinese Nationalists are highlighted – and Stalin’s communists did not always support the side you may think. In addition, the book tells us of the dilemmas, complications and joys that people had to live through in unfamiliar surroundings far from home. As you can imagine, some people reacted well, others less well, in situations that you could simply not make up. The book was years in the making and it is evident that it was a real labor of love. Above all though, Rand’s excellent writing shines through. He has the rare and great ability to make a story, even a non-fiction story, really come to life. But at the book’s heart are the tales of adventurers, mavericks, rogues. Call them what you will. People who decided to throw off the shackles of the ordinary and report the news from an extraordinary country at an extraordinary time. Just like some people still yearn to do today. Finally, you can read an article by Peter Rand in the latest issue of History is Now magazine, available here for iPad and iPhone. The magazine will be available on Android imminently. Now, tell the world! Share this article with the world by clicking on the buttons below!